The Coordination Commission meeting was held at the Ministry of Youth and Sport following the preparation for the 15th Summer European Youth Olympic Festival to be held in Baku next July. The meeting was attended by Azad Rahimov, Minister of Youth and Sport of the Republic of Azerbaijan, Chingiz Huseynzade, vice-president of the Azerbaijan Olympic Committee, the Organization Committee members, including Djordje Visacki, Chair of the Coordination Commission of the European Olympic Committees (EOC) and Secretary General of the Serbian National Olympic Committee, Líney Rut Halldórsdóttir, member of the EOC Coordination Commission and Secretary General of the Icelandic National Olympic Committee and Said Fazlagi?, member of the EOC Coordination Commission and Secretary General of the National Olympic Committee of Bosnia and Herzegovina who were informed on the current state of preparation for the Summer Youth Festival, Azertag reported. 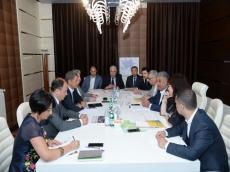 During the meeting the participants discussed the work undertaken by the "Baku 2019" Organizing Committee to date in preparation for the 2019 summer European Youth Olympic Festival including the sport competition schedule, the status of Athletes Village, NOC engagement plans, the volunteer program and other important issues. During their stay in Baku, the officials of the European Olympic Committees will also visit the National Gymnastics Arena, Baku Aquatics Center, Baku Sports Hall, Athletes Village and other sports venues. The European Youth Olympic Festival will take place in Baku on July 20-28, 2019. The opening ceremony of the Festival is scheduled for 21 July. In total, over 3600 athletes and team officials from 50 European countries are expected to visit Azerbaijan to join the Festival’s competitions. The competitions consisting of 10 sports (Artistic Gymnastics, Athletics, Basketball, Cycling, Handball, Judo, Swimming, Tennis, Volleyball, and Wrestling) will involve over 2500 volunteers. The idea of the European Youth Olympic Festival was brought to life in 1990 by Jacques Rogge, former president of the European Olympic Committees with the aim to provide a possibility for young athletes to get to know the Olympic Movement and learn about the Olympic values and ideals. It is the top multisport event for young European athletes between ages 14 and 18. The festival has a summer edition, held for the first time in Brussels in 1991, and a winter edition, which began two years later in Aosta. It was known as the European Youth Olympic Days from 1991 to 1999.